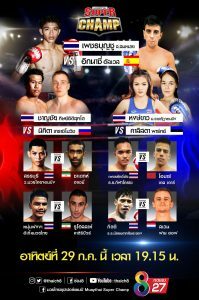 After 5 fights and 5 consecutive KO victories for young Catalan fighter (only 22 yo) of 7 Muay Thai Gym based in Rayong, it’s time to challenge a TOP Thai fighter like Sor Sommai. This Sunday’s fight, which will be at the 68 kg weight limit, will be an important test for both fighters. Petchboonchu can also fight at 70 kg and he’s looking to gain an international audience, therefore, facing ‘farang’ fighters is what his historic camp (Sor Sommai) had in store for him in the last year. While 7 Muay Thai Gym was looking for a young high level thai fighter to further test the young Spaniard’s skills. Sunday night (29th July) Live on Thai channel 8 starting from 19.15 (Thai time), ‘Muay Thai Super Champ’ event will be the arena where this two athletes will go head to head in the main event. This fight will surely be a great show for the fans and for elbow and knee lovers. The event can be watched live on Muay Thai Super Champ Faceboook page.